Music Theatre Karlin offers comedies with songs, operettas, musicals, excellent ballets or concerts. It is the biggest theatre in the Czech Republic, with a seating capacity of 1099. The building, itself has historical importance, it was built in 1881 in a mock-baroque style. Initially it was built to host the circus. Towards the end of the century, it was rebuilt for variety performances. After the First World War, a repertoire was designed around Karel Hasler’s cabaret. Over the next 20 years other theatre groups visited – for example the National Theatre of Bratislava. For the next 30 years modern operettas were performed but soon variety returned. In the year 1936 the “bench style” seating changed to all chairs. During German occupation, the theatre group operated from the closed National theatre, under the name, “Temporary Theatre”. In 1945, E.F. Burian began the regular service of the reputable music theatre, with an operetta, “The Vagabond King” in the Karlin building. Karlin’s official name has changed; first from The Theatre in Karlin to The Operetta in Karlin and finally The Comic Singspiel. After 1948; when the theatre was part of the Czechoslovak State Film Group under the name “Artist People’s Theatre”, under the ownership of Jan Werich and Oldrich Novy. Werich brought the most famous American musical “Finian’s Rainbow” from the theatre “V + W”, where the musical premiered in Europe. From 1950, the theatre became part of the city of Prague. Then from 1954, it became the property of the state, and was called “The Karlin State Theatre”; in 1961, it was returned to Prague control as the Karlin Music Theatre and has stayed this way to this day. From the beginning of the 1963/64 season, the theatre joined with the Theatre in Nusle, which gradually went into poor condition (it ended service in 1977). In 1981, Karlin worked with the theatre group Semafor (Traffic-lights), which stayed with Karlin until the end of 1990. In the year 1992, the little scene “Karlinek” was built (today, there is Semafor) in the basement of the building. The big Karlin scene attracted visiting foreign theatre groups – for example, the American Everyman Opera, TNP of Vilar, now it is often used for celebrity TV shows, pop-music concerts, etc. During the last 50 years some of the most famous people in theatre have visited: director Jiri Frejka; Jan Werich as chief of art, the actor Oldrich Novy and chief of an operetta; Alfred Radok directed in Karlin, too. 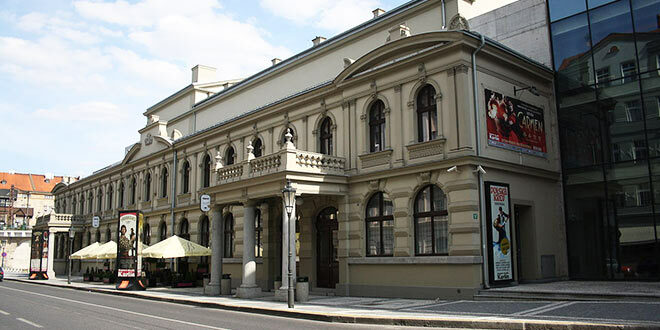 Vitezslav Nezval also cooperated with the theatre… Many famous artists visited the Karlin theatre: Ljuba Hermanova, Jaroslava Adamova, Jirina Steimarova, Rudolf Cortes, Vlasta Burian, Jara Pospisil, Vladimir Raz and others. From 1962, Karel Vlach returned to “Karlin” with his own swing band (who first performed between 1948 – 53). After 60 years the theatres reputation of operetta was joined by the musicals My Fair Lady; Can-Can; Hello Dolly! ; Kiss Me, Kate; Man of La Mancha; West Side Story; and others from Czechoslovakia (Gentlemen, Hornicek’s Bowler,…). Smaller Czech musical-comedies were shown in Nusle – for example Father, Mother, Jan and Katka. The end of the seventies saw the return of the plays by Jiri Voskovec and Jan Werich, with music by Jaroslav Jezek (i.e. Golem), and other world famous musicals – for example Cabaret. With the beginning of the eighties came the successful Czech musical-comedy “Zvonokosy” (by G. Chevallier) and at the end of that decade came the very successful production of the musical Sugar (Some Like it Hot) and original musical Gypsies Go to Heaven, both directed by Petr Novotny. The beginning of nineties saw the arrival of the external operetta director Oto Sevcik. He directed “The Gypsy Baron”, “Csardas Princess” and others. The young directors were, the important Gustav Skala (Polish Blood) and Libor Zidek (Merry Widow) and recently the operetta-drama director, Petr Kracik (The Bat, Lady Marica, The Land of Smiles). Petr Novotny externally directs classical musicals (My Fair Lady, Hello Dolly!, Some Like it Hot). Also, the more recent conductors – Milos Formacek, Frantisek Preisler jr., Arnost Moulik, Frantisek Drs. From 1993, the theatre manager became Ladislav Zupanic (as a soloist he worked in the theatre-group from 1970 till today). He confirmed the official name of the theatre “Karlin – Music Theatre, Prague”; he put together the theatre-group, and he made contact with other external artists. With his leadership came the successful Czech musicals: My Fair Josephine; Superstar Marenka; Snow Romance; Dreams from New York; The Angel with a Devil in his Body. Foreign musicals such as: West Side Story; President Quick and Easy; My Fair Lady; Hello, Dolly! ; Some like it Hot; Cage of Fools. Classic operetta Mme Nitouche, Polish Blood, Paganini, The Merry Widow, The Bat, Lady Marica, Rose Marie, The Land Of Smiles. The 50th anniversary season of 1995/96, brought the revival of Good Evening, Mister Strauss! It is based on the work of Johan Strauss’ son. Very important for the theatre was Yvetta Blanarovicova’s Thalie ’95 award for the role of Eliza in My Fair Lady; and in the category of opera, operetta and musicals was Jitka Molavcova’s award Thalie ’96 for the role of Dolly Levi in Hello, Dolly! In the new category of operetta and musical, the award of Thalie ’97 for Lubomir Lipsky for his extraordinary work in the role of Billy Kipp in Dreams Of New York and Ladislav Zupanic the Thalia ’98 of Albina in the musical “Cage of Fools”. The Karlin Music Theatre was many times a member of Musical and Operetta Days, which was arranged by the National Theatre in Brno. Karlin Music Theatre has a group of soloists; a symphonic orchestra – head-conductor Arnost Moulik; a ballet group – head of ballet Jan Hartmann, choir group – choir-leader Irena Pluhackova. From the 1997/98 season, conductor Frantisek Drs became a member of the group. The Karel Vlach orchestra works externally at Karlin. Its head is Jaroslav Drevikovsky. With the operetta repertoire, the theatre group visits foreign countries, where it shows it is of the same level as any theatre in the Western Europe. With the musical My Fair Lady Karlin Was in Japan Tour 2000. Karlin was first theatre from Czech Republic with a musical in Japan.